In this guide, I'll teach you how heavy weapons work, where to find them, and how to be good with them. The first time you picked up a Big Gun, you might see how low damage it does, however what the item stats fail to mention is this is the damage per shot, Big Guns shoot in bursts and bursts only, usually more than small guns, anywhere between 10-40 per burst, this results in a massive amout of damage being done if all shots hit, the probabillity that shots will hit is determined by the distance from your target and your Big Guns Skill. Big guns also often require high Strength, if you've decided on using a Big Guns character then I recomend that you start with 6 Strength, which allows you to use the Bozar and Light support weapon, and once you get Power Armor your strength will go to it's maximum of 10, allowing use of all Big Guns. Big guns also use massive amounts of ammo, having a ready supply of lots of ammo is nessecary to being effective with Big Guns. Something else essential to Big Guns is considering the Fast Shot perk, Fast Shot is one of the traits you can take at the begaining of the game; it reduces AP usage by 1 for everything, but eliminates the abillity to aim at specific parts of enemies, which you can't do anyway with Big Guns. This perk allows you to fire two bursts in one turn, and all it does is affect something that doesn't apply to big guns. 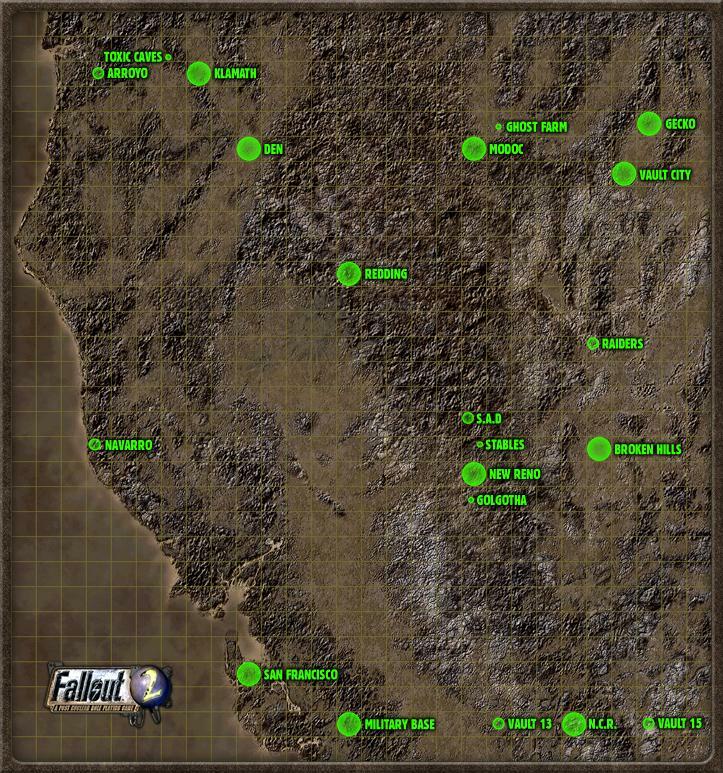 I'll also be mentioning alot of different locations in the game, If at any point you don't know where one is, refer to this map. The weapons mentioned in this section all use .223 ammo, amoung them are the Bozar and Light support weapon. The Bozar is by far one of the best Big Guns in the game, It has a 30 round magazine and shoots 15 shots per burst, which tends to make it burn through .223 fairly quickly. it's excellent agaisnt all kinds of enemies because of it's massive damage output. If all shots hit (not very likely), and it does it's median damage at 30 damage per shot, it will do 450 raw damage, However, this number can exceed over 800 if it's critical. There are many ways to aquire a Bozar; The easiest of which is to pickpocket one of the three guards at Buster's Gun store in NCR, every guard there has a Bozar, usually I'll pickpocket all three, keep one, and sell the other two to buy a Light Support Weapon. 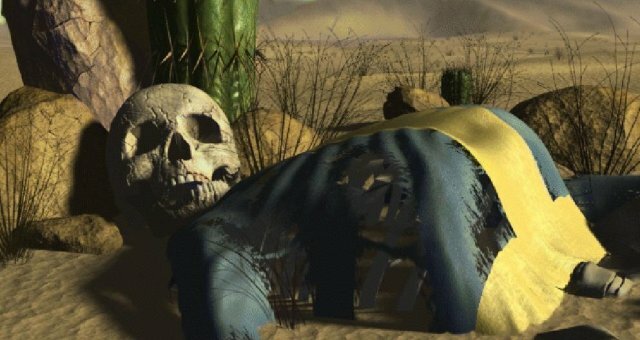 Also, if you didn't already know, pickpocketing in Fallout 2 is very different than other Fallout games; It's much more probable to do it successfully with a low steal skill, and also you see all things in a person's inventory regardless of your skills, so pickpocketing these Bozar's is really easy. 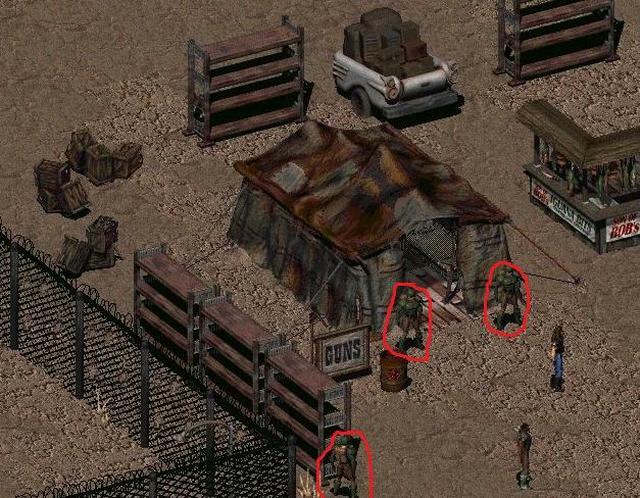 The guards circled in red in this image all carry Bozars. The Light Support Weapon also uses .223 ammo, It's median damage is 5 less than the Bozar, but it has the advantage of having a little more range and shooting 10 rounds per burst rather than 15, saving more ammo, because 10 rounds at 20-30 damage is still enough to one-hit most humanoid enemies unless they're wearing good armor or have tons of health. So it's better to use agaisnt weaker targets, where as the Bozar should be reserved for tougher enemies. The Light Support Weapon can be bought at Buster's Gun Store and The Red 888 Gun Store, one is also carried by one of the Morton Brothers, The Morton Brothers are a gang that may attack you in a random encounter if you kill Frog Morton for a quest given by Redding's Sheriff. Also, according to the wiki, Clam Jumpers will sometimes carry them, however I've yet to see one being used by a Clam Jumper. Miniguns excell at doing massive amounts of damage to soft targets and softer armors, this is due to 5mm JHP being the only practical ammo for the Miniguns using 5mm rounds (there's one that doesn't) 5mm AP in Fallout 2 is broken as hell, and AP rounds do signifigantly less damage then JHP, and have a very weak armor-piercing effect, they do either no damage or a ittle damage. Miniguns are suprisingly difficult to find, the easiest ways to get them are through very specific random encounters with Super Mutants, Merchant Guards, or buying them. If you're looking for the standard minigun then look at the previously listed random encounters, but there's a better variant that does more damage called the Avenger Minigun, it can be purchased from either the Red 888 Gun Store in San Francisco or Buster's Gun Store in NCR, there are also 2 in the Enclave Oil Rig, the easiest to find is in one of the ammo crates in the northenmost corner of the Guard Barracks, that's the first room up after entering the Oil Rig. There's one more Minigun in Fallout 2, it's called the Vindicator Minigun, it's description describes it as superior in all ways to the Avenger Minigun, however this isn't the case; it has less magazine capacity at 100 intsead of 120, fires 25 rounds per burst instead of 40, and uses the scarce and expensive 4.7 caseless ammo, which gives it a armor-piercing effect. The only advantage it has over other miniguns is it has the most damage per shot, not burst though. It can be found at the Red 888 Gun Store for a massive price. Rocket Launchers can be found all over the map, particularly in the south end of Fallout 2's world. Super Mutants and Nightkin use them in random encounters, they can be purchased in the Red 888 Gun Store in San Francisco, and one is small building outside Sierra Army Depot. To get the location to Sierra Army Depot, first you need to work for Orville Wright in New Reno, his family's home is the East Side. Do his first mission and he'll ask you to secure a way into the Sierra Army Depot, and grant you the location. The Rocket Launcher is located in small building near the west end of the surface, you'll have to get past the powerful turrents and some traps to enter the building. It's the same model as the one of the surface entrence to the Brootherhood Bunker in Fallout 1. Also note that inside the ammo crates in the second floor of the Sierra Army Depot are around 2 dozen rockets. Written by Pz. Kmpfw. VIII Maus.